Speaking in relation to the second major controversy he triggered in a course of a creatively chaotic life (namely, his deal with one of his closest friends that the latter’s body would be embalmed after his death and kept at the artist’s studio), Lenkiewicz observed that, in his opinion, what people are struck with when witnessing death is the ‘total absence of the person running parallel to the total presence of the body’. 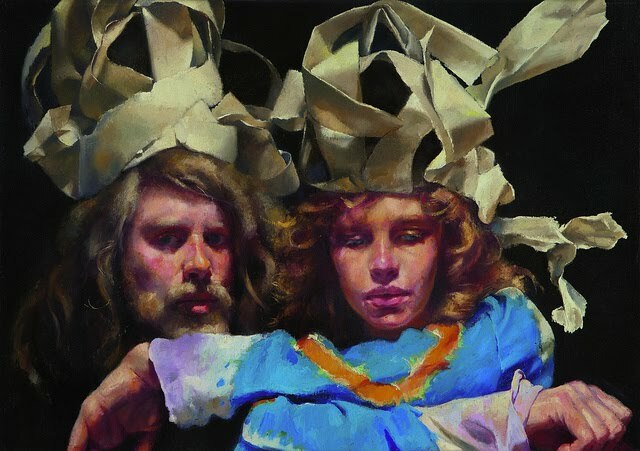 Lenkiewicz’s preoccupation with absence, ageing, and dying, and his lifelong attempt to grapple with these concepts inform the majority of the works exhibited at the Royal West of England Academy. The first gallery exhibits works such as Mr. Earl Senior, of Earl of Plymouth Funeral Service; Employees and Family and Mr. Harry’s Club, large canvases populated by groups of sitters. Both works are remarkable in the fact that the majority of the people depicted are not making eye contact, with the neither the viewer nor each other. There is a haunted quality to the sitters, a feeling of avoidance and subterfuge: as though the formal attire worn for the occasion by the group in the former painting and the bright-coloured party clothes of the group in the latter are meant to draw the viewer’s attention (and the sitters’ own) away from the ever-present spectre of death hovering around them. The Burial of John Kynance is particularly poignant in that respect, as in this painting Death himself puts in an appearance: a pale figure almost blending into the background, unnoticeable at first against the dark browns and somber blacks of the rest of the figures. Ever present in his jester’s hat, he mocks the living; who turn their attention toward the dead, all the while ignoring the very presence of death around them. The smaller gallery to the right showcases a number of self-portraits, the proliferation of which invites comparison to the numerous self-portraits executed by Rembrandt. And yet, where the Flemish master uses self-portraiture to document in agonising detail the ravages wrought by a lifetime onto his face (and psyche), Lenkiewicz’s approach to the practice stands in diametric opposition. Although his self-portraits span more than four decades, there is little if any change in the artist's physiognomy through the years. These portraits, it is implied, aim not to portray Robert Lenkiewicz but a picture of him: a representation not of a person, but of a picture of a person. Thus, twice removed from his work, Lenkiewicz manages to extract himself from the here and now, from the passage of time and its necessary restrictions. Far from attempting to achieve immortality through art, he presents himself as already if not immortal, then unchangeable and unageing, and therefore occupying the best vantage point from which to expose ageing and death to others through the medium of painting. It is no coincidence that in most of the self-portraits the artist’s eyes peer out with the almost cold and disinterested air of clinical observation. Especially worthy of note is Self-Portrait With Mephistopheles. The canvas is split roughly down the middle into two panels, crowding into each other and vying for the viewer’s attention: two framed mirrors at odd angles, the one reflecting the artist’s arm (presumably in the act of painting), the other his face. In the lower foreground of the composition, on an empty chair –an object which for Lenkiewicz encapsulated the concept of absence- a spurt of red paint jets upward and forward, as though gushing out of the discarded paint tubes visible in the bottom left-hand corner of the mirror. On closer inspection, the jet of red turns out to be an elongated figure tightly clutching its fiery cloak around itself, its head bowed in a gesture of servitude which is nonetheless belied by the sly conniving grin on its face. Is the painting an admission or a warning? Perhaps it is simply a statement of kinship; it is worth remembering that, at least in Marlowe’s version, while Mephistopheles may have enabled Faustus’s empowerment in exchange for damnation, he was all the while himself trapped in his own hell. In the adjacent room, Study of the Painter’s Dead Mother exemplifies the way in which the artist’s defiance of temporal restrictions informs his work. The painting is a masterful depiction of the moment immediately following the transition from living to deceased, the mother's eyes half closed, her mouth hanging slightly open, her face literally glazing over before our very eyes. The mother’s head is shown floating in a sea of white, which could be the sheets on the bed, or it could be the inside of a coffin, or it could be the nothingness that comes after death. The transition between being alive and being dead is seamless, and already deadness flows into what until a moment ago was a locus of life. At the same time, observing the painting we are reminded that death is as much a momentary transition as it is a process: death happens not only to the person who dies but also to their loved ones, who will subsequently have to go through the motions of grieving and processing the loss. A painter can take months or years to complete a work depicting a moment that has long since transpired, and the work will be no less valid. Parallel to that, an individual can take equal amount of time to fully come to terms with a death, which in effect will not fully take place until the moment when it is truly accepted by the bereaved. Project – The Painter with Mary: a Study in Obsessional Behaviour. I saw this exhibition today, simply because I was passing the venue. I loved it - there's something mesmerising about his self portraits. Really worth a visit.